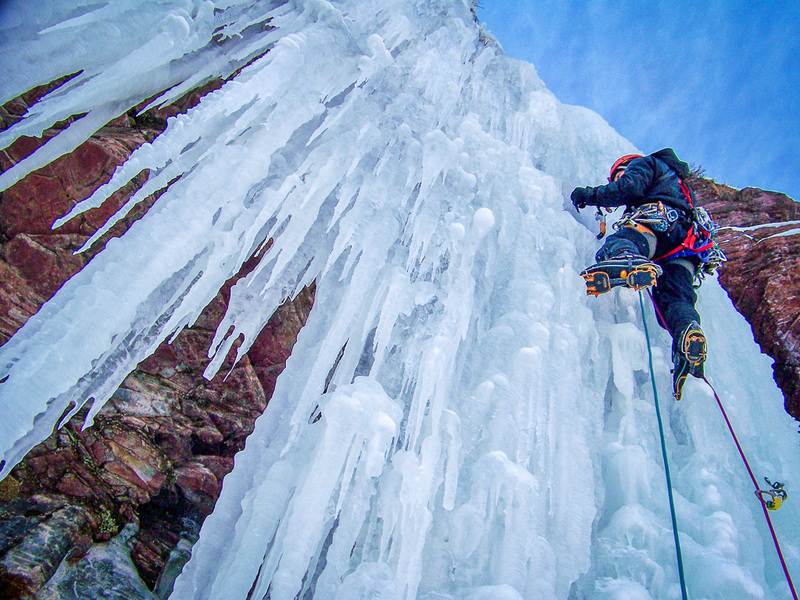 If you’re even thinking of trying ice climbing, you have the spirit of adventure. Let’s cover some basics, plus give a few tips and tricks so you have the best day on belay. 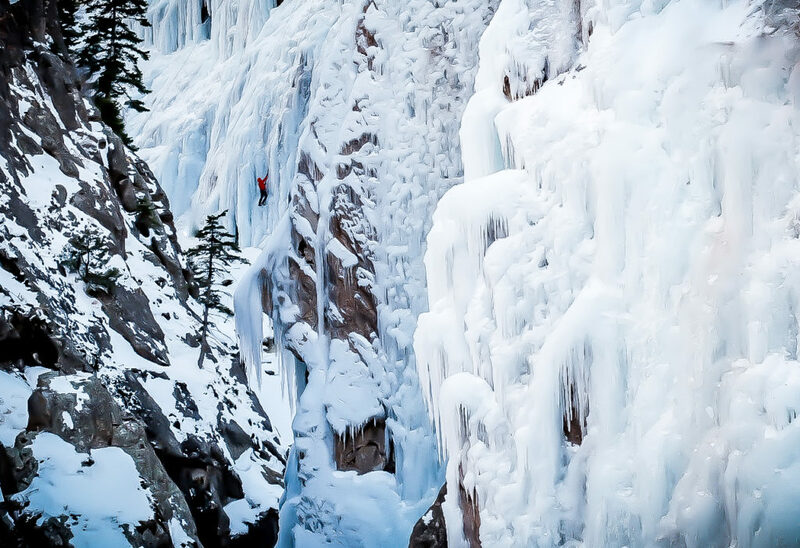 The Ouray Ice Park in Ouray, Colorado, is a place where climbers from all over the world come together to refine their skills and push themselves to their best in a teal blue world of ice and exploration. It’s also a place of learning. Guide services and new climbers abound. This is your chance to blow your mind. 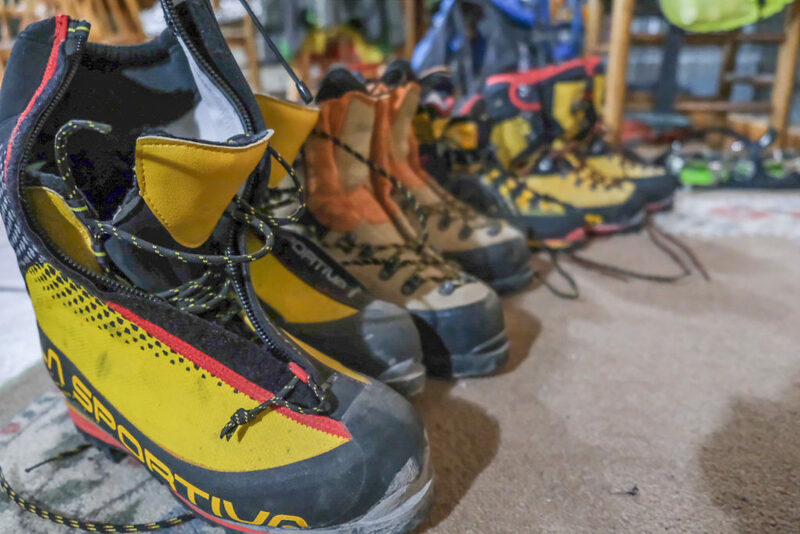 Mountaineering boots come in all shapes and colors. What’s important is warmth, comfort and fit. Photo by Brandon Mathis. Climbing helmet: A certified rock climbing helmet is fine. Crampon compatible mountaineering boots: Look for a boot with the specific toe and heal grove designed to work with a step-in crampon. Strap- on crampons will work but are less than ideal. Crampons: Go semi-automatic. While not completely rigid, these operate similar to a ski binding and fasten securely to a mountaineering boot designed for them. A heavily used pair of semi-automatic crampons on a typical modern mountaineering boot. Notice the wire bail at the toe and heel ,and how they fit specifically onto the boot. Photo by Brandon Mathis. Climbing harness: There are specific ice climbing harnesses, but a rock climbing harness will do. All of these items are readily available to rent or can be provided by a guide service. You’ll also need ice axes, called tools; however, in a learning scenario those can be shared among a group of new climbers. With hundreds of routes available for climbing in the Ouray Ice Park, groups of two or more commonly set up a top rope system where climbers are essentially tied into a rope that is safely anchored to a point above them as they are belayed, or secured, by their partner, usually on the ground below them. The belayer takes up slack in the rope as the climber ascends. Along with the skills and gear to set up a top rope system are various commands, part of a language that needs to be learned so safety is always understood and communicated (check out the fun glossary of commonly used ice climbing terminology below). This is where a trusted, experienced climber or, better yet, a guide service comes in. 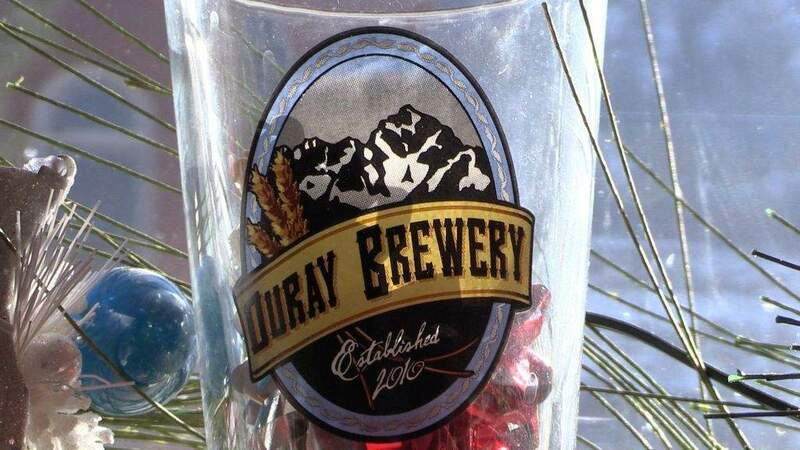 In fact, some of the most accomplished mountain guides in the world work and live in Ouray. This climber has four layers on in this photo: a base layer, an thin insulating layer, another thicker mid layer, and an outer shell. Her down puffy jacket is at the ready nearby. Photo by Brandon Mathis. Just like any winter activity, think in layers. A base layer of wool or synthetic against the skin is ideal, wicking moisture away from your body to keep you dry and comfortable. A middle insulating layer will trap body heat under an outer protective layer that guards you from the elements like wind, rain, snow and cold air. It’s 2019. The world is amazing and so is modern footwear. Putting on several pair of socks is unnecessary. Choose a pair of synthetic or wool socks that fit your feet and make sure sure your boots fit as well. If you insist on doubling up, consider just a thin liner under your sock. If you like your ski pants, don’t wear them. Ski wear will work, but most pieces are cut a bit baggy, and considering you’ll be unaccustomed to walking and climbing with crampons (sharp-fanged traction devices on your feet) your pant legs can take a beating. The same goes for a jacket. A shell might be safe from crampons but not those novice swings of an ice axe. For functionality and practicality, a slimmer fit all around will make the experience better. Rope management is part of climbing. Getting used to doing everything with gloves on is part of ice climbing. Photo By Brandon Mathis. 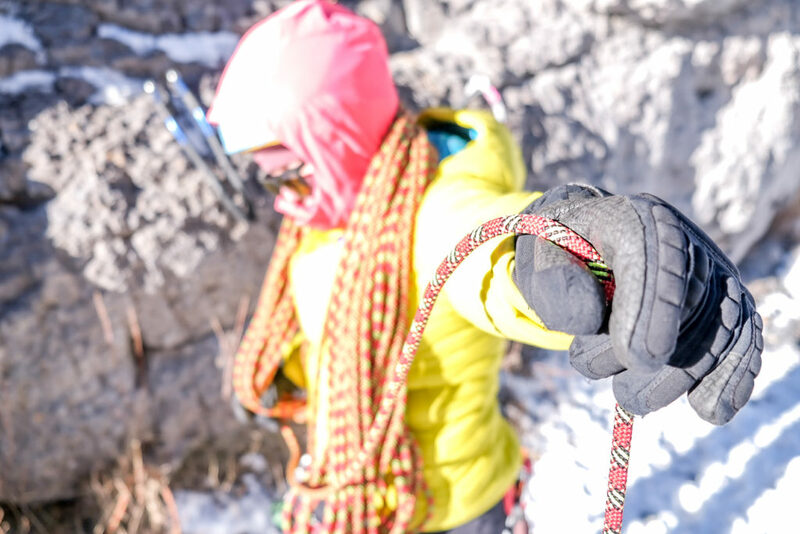 A good practice is to keep some warm gloves for non-climbing, then climb in a pair of thinner superior quality gloves. Whatever gloves you’re not wearing, keep them in your jacket close to your body so they’re warm when you put them back on. Again, for climbing and gripping the handle of an ice tool, you’ll appreciate a proper fit. 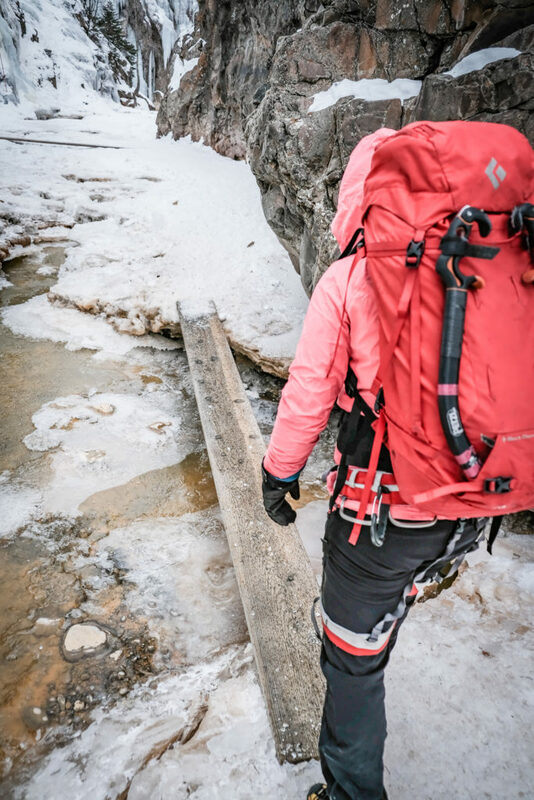 The act of climbing will warm you up, but as soon as you’re back on level ground put on that big cozy puffy down or synthetic jacket, even if you’re comfortable. Think of it this way: It’s much easier to stay warm than it is to warm up. If you are getting cold, put your backpack on and take a walk. Do some jumping jacks. Find a hill to march up and down a few times. Generating body heat is the best way to get warm in a cold canyon made of ice in the middle of winter at 7,000 feet in the San Juan Mountains. They thought they were done for the day. 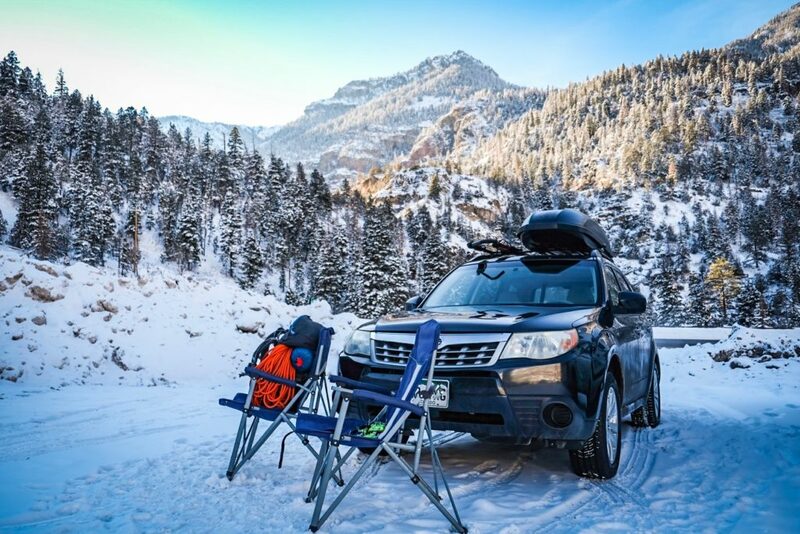 The Ouray Ice Park is full of adventure. Getting in and out of the climbing areas is all part of it. Photo by Brandon Mathis. Ice shatters in fragments and falls down, especially when people climb it, and just like it’s rocky natured cousin rock climbing, helmets are as much about what’s coming down from above than anything else. Be aware of what is and who is above you. When someone yells “ice,” that means ice coming down from above you. Stay clear of the line of fire. You might find some areas where boards are laid across open sections of running or standing water at the bottom of the canyon. Think of this as part of the adventure. Odds are if they are there, it’s the best possible way to cross open water. You can find your own way but you risk stepping through the ice and into the creek. Trust us, people walk over these all day all season long. Enjoy the thrill. A typical water crossing in the Uncompahgre Gorge, aka the Ouray Ice Park. This might seem strange at first, but most climbers grow accustomed to it. Photo by Brandon Mathis. Don’t let the word “park” throw you. 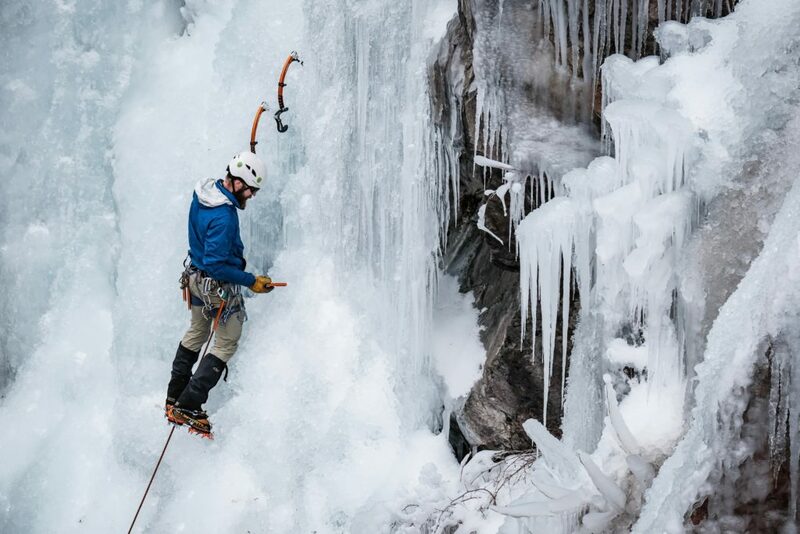 The Ouray Ice Park is a rugged, narrow canyon in the Rocky Mountains, carved by rushing water and gravity. Walking on the edge of it poses real danger. Walking or, really climbing down into it, can and does push the comfort zone of some visitors. 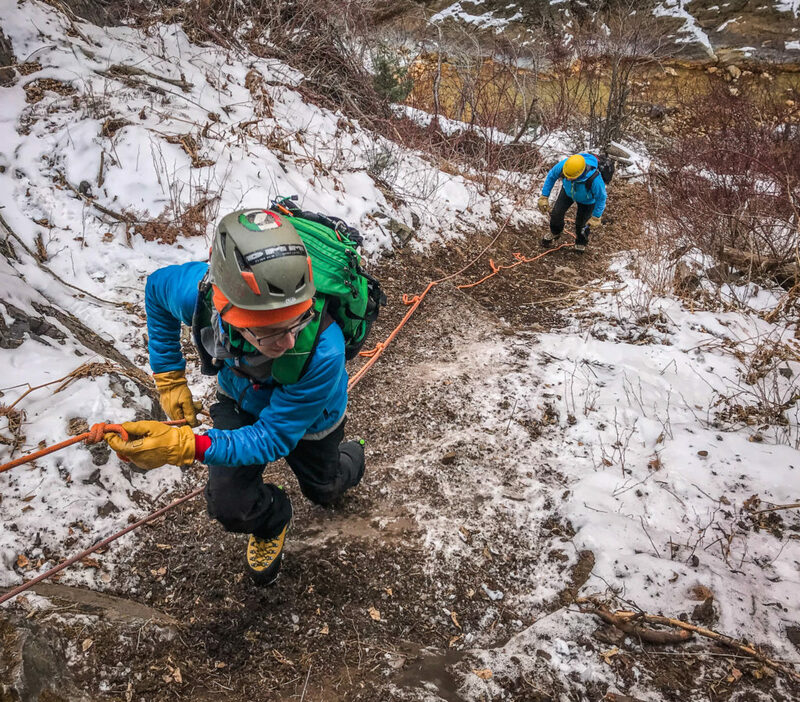 As soon as you enter the Ouray Ice Park, you need to be aware that it’s on you to be safe. Use fixed lines, use steps, use the planks, and always stay alert to others around you. Here are some finer details from experienced park regulars who know how to make even the coldest days fun. Take a big thermos full of hot coffee or tea or other hot liquid. It’s amazing what a jolt of hot fluids will do on a cold day. Plus it’s a great way to make friends. Take cold-proof snacks: chocolate covered peanuts, sausage, cheese –anything that won’t freeze solid in a few hours or, if it does, will taste good. Buffs (a tube of lightweight fabric you can use as part of your attire) are great comfort items. Keep them handy. If one gets icky, swap it out. Use clear lens eyewear to protect your eyes but will allow you still see. Ice flies everywhere, so you’ll need that protection. Hot pockets in your pockets. Plan accordingly. Those big box stores are about 60 miles away from the Ouray Ice Park. 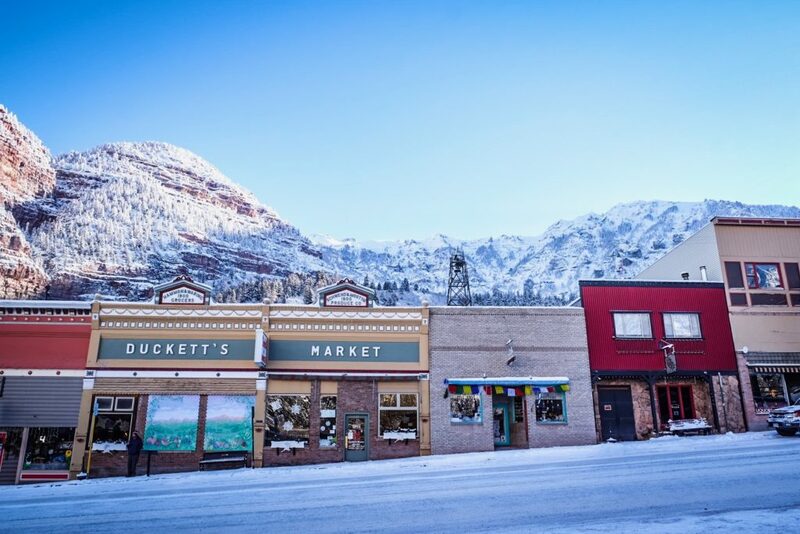 Duckett’s Market is your best bet for snacks and groceries while in Ouray. Photo by Brandon Mathis. Don’t over-tighten your boots, because you will reduce circulation to your feet. Don’t wear cotton. During exertion cotton absorbs sweat like a sponge, creating an evaporative cooling effect for your body by holding moisture next to you skin. Go with synthetic or merino wool fabrics against the skin and remember to think in terms of layers: base layers, insulating layers and outer layers. Don’t step on the rope. Remember you have sharp pointy things on you feet and that rope is your lifeline. Treat it with respect. Take some hand cream. Your skin won’t be happy after you a few days of cold hands in a pair of damp gloves. Aprés climbing. While visitors fight for parking closer to the ice, many climbers opt for a little more room just a short walk away. Never underestimate the power of a camp chair. Photo by Brandon Mathis. Parking is an issue at the park on busy days at the Ouray Ice Park. Instead of parking appropriately (or illegally) in the always-full upper lot, go for the lower lots off U.S. Highway 550. Often there is plenty of room and ample sun. The short walk to the park is a nice warm up, and you can tailgate when the day is done. 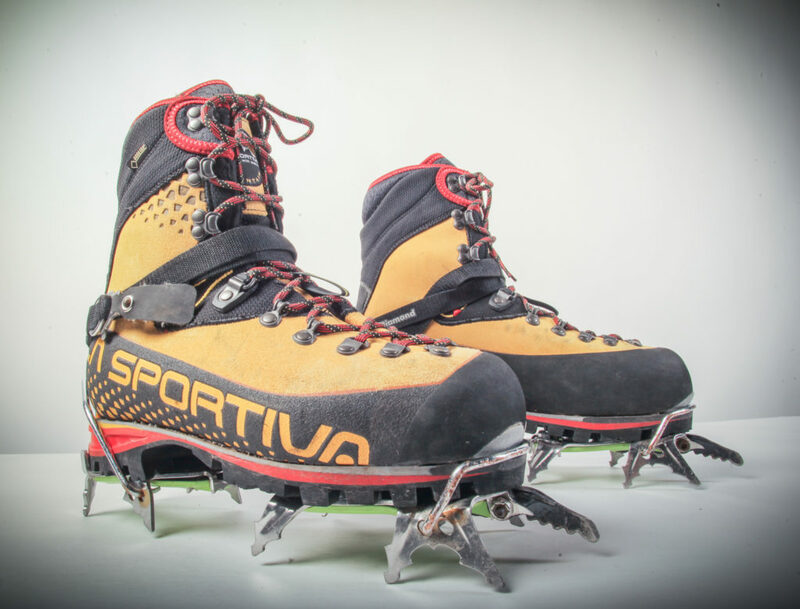 Crampon: Traction device that is attached to footwear to improve mobility on snow and ice during ice climbing. Front points: One or more points at the front of your crampons. Secondary points: Smaller, shorter points behind the front points that can engage the ice when used efficiently. Bail (toe and heel): The adjustable wire at the front and rear of a semi-automatic crampon that is essential in fastening to your boot. Ice tools: Common reference for ice axes. Belay: To fix and manage a rope in a manner of securing and controlling it. Belay device: A tool used to aid in belaying. Tope rope: A manner of securing a rope though a main anchor and then to the climber below it. Line: Another word for rope. Slack: Decreasing tension on the rope. Take: To increase tension on the rope. Anchor: A point of security, either for a climber or the rope. Figure eight: A common knot in climbing (and sailing), this stopper knot disables rope from passing through it. Tie in: To tie into the rope with the figure eight knot. Triangle: Practical body position while climbing for optimum stability and balance. Hook: To use the pick of an ice tool to hook a pocket, hole or depression in the ice instead of swinging the tool into the ice. Pick: The sharp portion of an ice tool that engages with the ice. Placement: The location of the ice pick on the ice. Kick: The action of forcing your crampon into the ice. 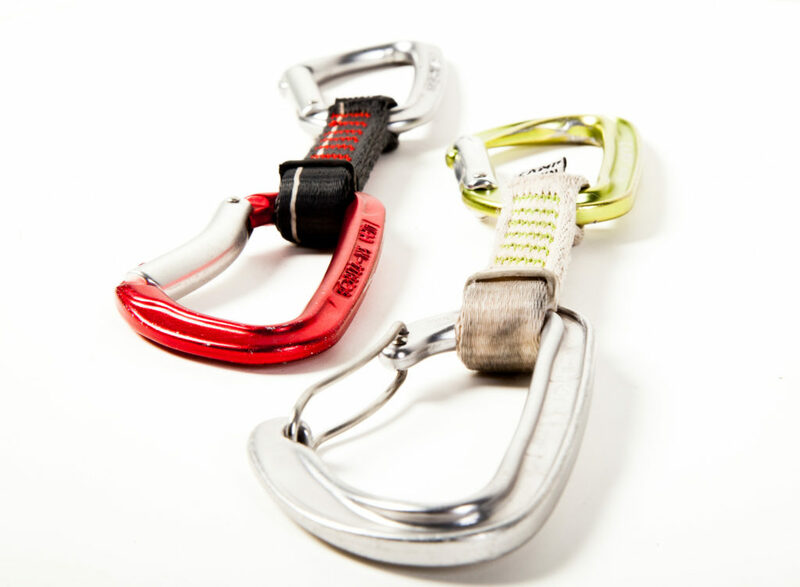 Quickdraw: A set of two carabiners connected by a runner, or strong piece of nylon material, that is used by a lead climber to connect the rope to a kind of protection. Two modern quickdraws. Photo by Brandon Mathis. Screaming barfies: A trifecta of things that create a common experience for ice climbers. 1. Tissue ischemia is caused by cold conditions where blood is naturally routed to your core instead of your extremities (hands and forearms). 2. 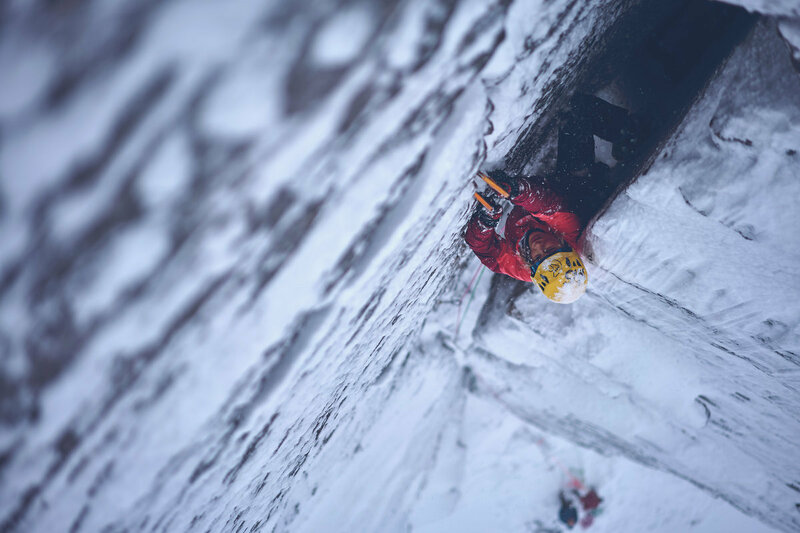 The act of gripping ice tools and climbing with them over head adds to the lack of circulation. 3. When the climb is finished, the arms are lowered and blood returns to the extremities resulting in severe discomfort, and the onset of extreme pain triggers a natural response in the nervous system: nausea. Have fun. Pump: When your muscles reach their threshold. Flash pump: When you fatigue more quickly than anticipated. Lead: Traditional method of climbing where the belayer feeds rope to the climber who ascends the route while placing protection along the way and feeding rope through it in the event of a fall. 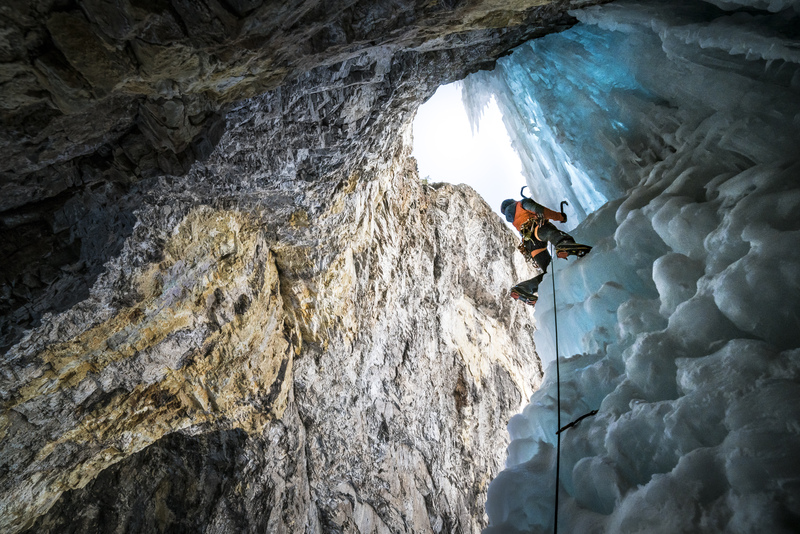 An ice climber leading a route places screws into the ice as a way of securing the rope to it to help if someone falls. Photo by Brandon Mathis. 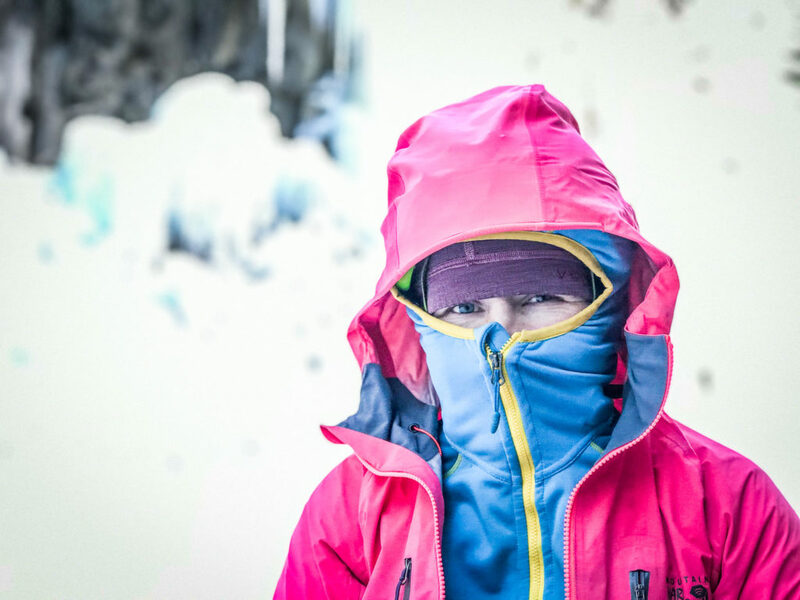 Ice screw: The most common and efficient form of protection in ice climbing. 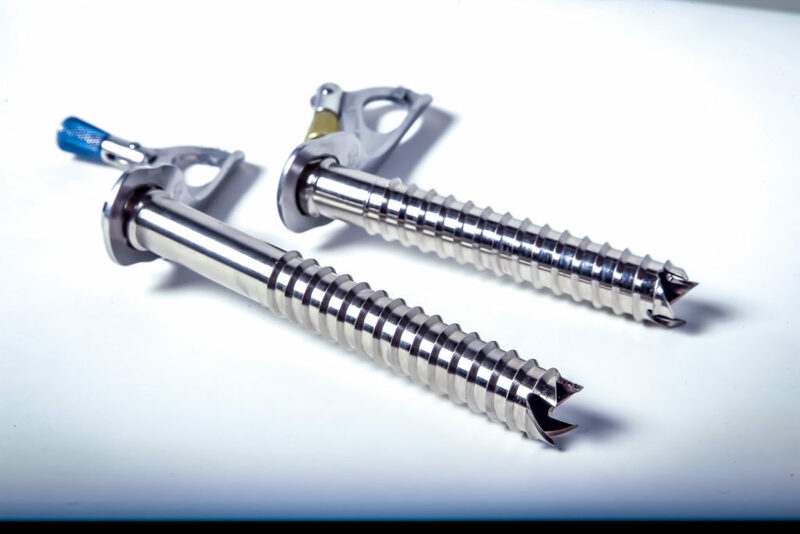 The threads of the modern ice screw, similar to a wood screw, create the holding power, keeping the screw threaded in the ice. Photo Brandon Mathis. Bomber: Something that has great strength. 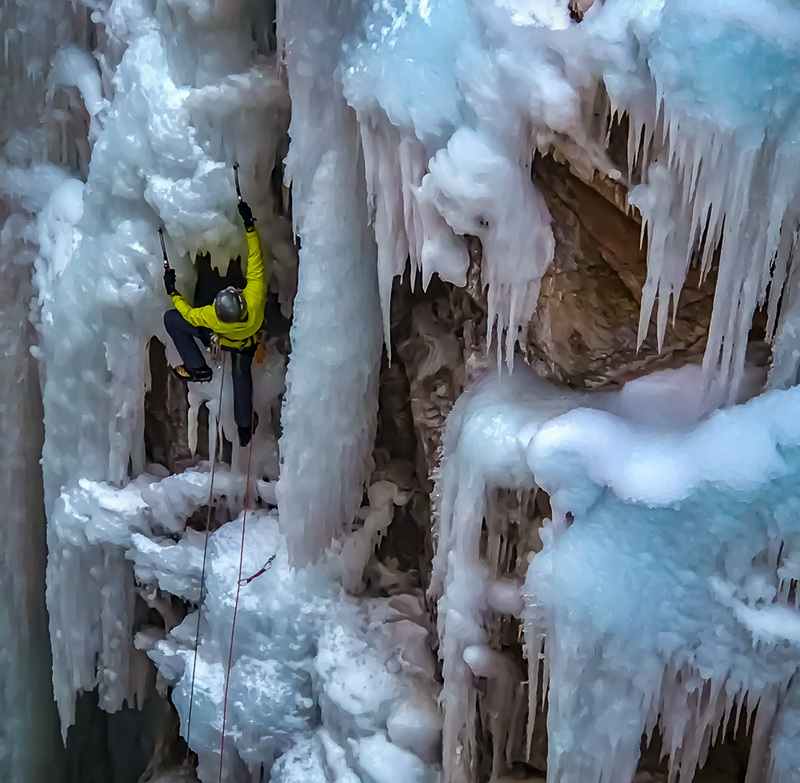 A great way to get introduced to ice climbing at the Ouray Ice Park is by attending the Ouray Ice Festival, Jan. 24 – 27, 2019. Thousands of ice climbing enthusiasts from around the world attend this annual event where many compete in speed and climbing competitions, and climbers of all levels are taught skills from professional guides and instructors. You can also catch evening presentations from some of the world’s most accomplished climbers and mountaineers.